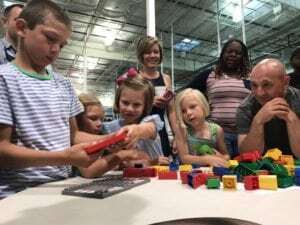 On Saturday, April 22nd all Costco employees gathered at the warehouse in West Ashley to talk about the upcoming Children’s Miracle Network Hospital’s campaign to fundraise for the MUSC Shawn Jenkins Children’s Hospital. The employees were joined by seven previous and current patients of the hospital along with their families. 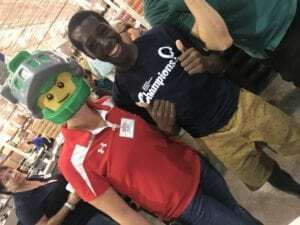 Each patient was paired with a different group of employees to build a hospital out of legos. During this breakout, the patients were able to tell their story and experience at MUSC Children’s Hospital to all of the employees in their group while also interacting with one another to design and build a hospital. The creativity from the kids was apparent when they talked about what they had designed to the entire warehouse. Rooftop play areas and helicopter pads were built. Many of the things that were created are actual things that will be incorporated into the new MUSC Shawn Jenkins Children’s Hospital. This meeting was designed to motivate the employees to do their best during the CMN Hospitals campaign that kicked off on Monday, May 1st and will go until Wednesday, May 31st. This year marks the 30th year of the partnership between Costco and CMN Hospitals. When shopping at Costco, if you are asked to donate to CMN, know that your donation will benefit the campaign for the new MUSC Shawn Jenkins Children’s Hospital, as we are the local CMN Hospital for the lowcountry. 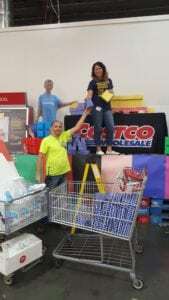 If you would like to meet some of our patient families, shop at Costco every Saturday during the month of May between 11:00am and 1:00pm and they will be there to greet you in the warehouse. Employees have spent time decorating the store to resemble their ‘Let’s Build It – Lego’ theme. Check out the decorations and thank the employees for their support to our community and the new children’s hospital. Without our community partners this would not be a reality. Previous post: Get Fit. Help Kids.